Buying a Wedding Dress is not easy despite if it’s for you, your mother or your bridesmaid. In case, you haven’t sorted out your “A-Team,” its high time you do so! Following, we are giving a few tips that will help find the best dresses for your maid squad without breaking the bank. It’s a debatable thing whether the bridesmaid should pay for their dress for you. So, you need to have this conversation with them, but be polite. It’s not rude because you guys are paying for a whole wedding, so they shouldn’t mind covering for their dresses (individually). A bridesmaid should be kind and considerate. But don’t always expect everyone to fall in line because some may refuse to pay for it. They might have valid reasons like they didn’t expect or think its rude of you asking them to buy their dresses, they didn’t volunteer to become the bridesmaid, you did, why they should buy something she won’t wear again, and lastly, she has no say in style. It’s an awkward conversation, but you better have it. Be polite and accept what they have to say. Just make it clear to them you are affording the whole event, and bridesmaid dresses are a considerable expense. You would appreciate if they can lend you a hand. The Bridesmaid is responsible for two things during your wedding; they should assist you throughout the day and make you look fabulous. That doesn’t say they should look good themselves. Just make sure they don’t steal the show from you. The best way to do it is pick something which will complement your dress in respect of fabric and color. You don’t need to buy the same dress for everyone, just pick a unifying element. It can be the style, fabric, or color. Just makes sure your maids are coordinated with each other. Provided you had the conversation and had a few guidelines to follow when picking up the wedding dresses, you should hit the road with your friends. Go with them as long as the group isn’t very big. If you don’t have the time, you better take the chief bridesmaid, select the style that will suit everything and send the snaps to rest of team. It will save you from wasting your time and the confliction of opinions. You don’t want to deal with that in the midst of all preparations. Remember, not every bridal shop will accept drop-ins SO you better make an appointment in advance to see the bridesmaid dresses. Just like the bridal dress, you better shop for these dresses months before the big day. 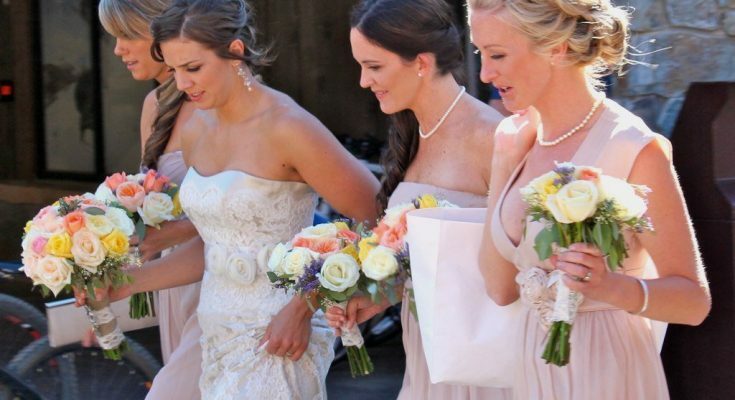 It will give your fellow bridesmaid enough time to make alterations. You don’t need any last-minute nightmare. It may ruin the wedding for one of your friends.